This is been a busy mofo of a week. I'm just coming up for air, was there an announcement about the iPhone coming to Canada? Oh yes, here it is. In the worst kept secret in Canadian telecom history, Rogers will be bringing Apple's iPhone to Canada later this year. In 2005, I outlined the ideal phone for me. I wanted a phone that wasn't just a phone, but an MP3 player, web browser and more. 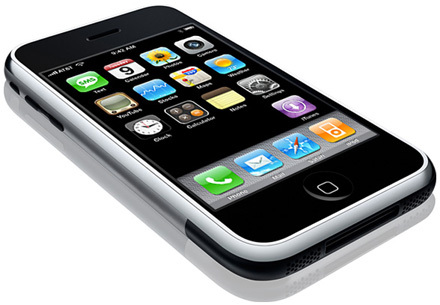 Then, in 2007, I declared that I had found what I was looking for, and Apple was calling it the iPhone. The iPhone would be my very first mobile phone. Since I wrote that entry, work has given me a Blackberry. So long as I'm not seeing an invoice, I won't be switching, but once I'm paying my own way, I'm knocking on Apple's door. The iPhone is the one. Oh boy I can hardly wait for this weapon of mass distraction to arrive. In other words, what is the big deal? I want one too. But as I wrote here, I can't have one. I have a couple of friends who already got them from the states and they are worse then the crackberry. Never mind sleeping with it they have relationships with them. We were at a party and I never saw the phone leave their hands the whole night. I ALMOST got a BlackBerry Pearl 1830 last night at Best Buy for $50 with Telus and I would've been happy with that. I wouldn't go with Robbers(tm), or Bell and would never go back to Fido. Well, as long as you can get a unlimited data plan for a decent price, the iPhone would be a good choice. Jason, you're clearly not a luddite, because luddites don't blog. But what's your angle? Is it that you reject anything popular? I have been trying to acces this site for a while. I was using Chrome then when I tried Safari, it worked just great? Just wanted to bring this to your attention. This is really good site. I have a bunch myself. I really like your layout. I know this is off topic but,did you make this design yourself,or purchase from somewhere? I put a link tou your blog at my site,hope you dont mind?